You are God and God does not exist. My defense of Eastern philosophy. First of all, I don't think that my following words are accurate, because I don't think Truth can be fully accurately expressed with language, but I have tried to use language to effectively point to Truth. Like in all other fields and worldviews, minor to moderate disagreement exists among non-dualists. I think it's unlikely any non-dualist will agree with me exactly on every single statement I make, but I do think most non-dualists will certainly agree with the gist of what I say. Yes, a lot of Western philosophy is incoherent and wrong if reality is non-dual, but I personally feel like everyone should try to evaluate truth without bias and with an open (but skeptical) mind. I actually used to be a pretty smug non-spiritual atheist who read a lot of Western philosophy for the longest time. But I'm obviously controverted. And yes, reality isn't the bad and dreadful nightmare so many of us imagine it to be (even if many of us try to pretend to ourselves that it's not such a bad and dreadful nightmare after all, because hell is all many of us have ever known) if reality is non-dual. But maybe reality is okay and neutral rather than bad and dreadful? We are immortal beings if reality is non-dual, yes, but there is a lot of suffering in reality, to say the least. Non-duality isn't as nice and peachy as it might at first sound, even if I do think that no-death is probably preferable to annihilation. It' also worth pointing out that most of us are deeply, deeply mad if reality is non-dual. Why? Well, we are judgmental, selfish, and jealous; we are entrenched in the insoluble and unquenchable game of desire; we abuse, steal, and even kill; and we are horrified and terrified of death. And yet, if reality is non-dual, everyone is everyone and there is no death. We live completely and totally contrary to Truth, if reality is non-dual. And as we all know, most mad people do not, at first, want to realize that they are mad—much less that they are crazy in a house of crazies. And yes, I am defending a philosophy that fundamentally contradicts itself, but just hear me out—if you want, of course. It's a long post. I'm posting this to hopefully hear constructive criticism, and I figure some of you will find it interesting and worth reading. So why not consider the existence of God? I of course don't mean the anthropomorphic and obviously non-existent slavemaster Santa-man sort of creator who sends his creations to everlasting heaven and hell realms largely on the basis of whether or not one obediently holds a blind faith in his existence. I mean rather the Infinite Consciousness, the Awake Nothingness, the Shining Void, the Luminous Blankness, the Pure Awareness, Being itself. The Prime Mover—that which gave birth to All and lies prior to All—must itself lack any kind of quality or attribute or limitation. In other words, it must lack any kind of shape or size or texture or color or sound or state. The Prime Mover has therefore got to be a sort of Timeless Primordial Awareness of No Content that Necessarily Inhabits its Creation. In the same way a potter cannot form a pot with clay, Divine Nothingness cannot form anything truly solid or truly "real" in the ordinary way we conceive of things as being solid and "real." Divine Nothingness, in other words, cannot create anything non-Divine. So, out of the Void comes Everything, and we're all IT: the body, everything we see before the body, including whatever other beings we happen to see; everything is the real us. The real us is the whole of Reality. We are at once Nothing and Everything. Zero and Infinity. Emptiness Dancing. One Nothing (or one Thing) appearing in many different ways. Universal Consciousness having dreams and experiences in its interconnected Realm. Reality's divinity might at first sound a little miraculous, but is it not a little miraculous that we currently find ourselves in such an orderly universe? Is it not a little miraculous that anything exists? Indeed, I'd argue that it takes a greater leap of faith to believe our universe exists without purpose or divine inspiration. Reality is just a miracle. It's a miracle that there was Nothing, and it's a miracle that Nothing gave birth to Something. A human mind might try to understand Existence by thinking to itself something like, "Nothingness and Somethingness are interdependent/inseparable/come into existence together like all other pairs of opposites, so that's why there's Something that's actually Nothing," but a human mind can really not even begin to comprehend Existence other than by noting how miraculous everything is. As Richard Feynman said, "Nature's imagination is so much greater than man's." What I mean by "Awake Nothingness" or "Pure Awareness" might at first be difficult to understand, but it's only difficult to understand because it's paradoxical and its reality requires everything you currently think you know to be true to be absolutely false. As Alan Watts said, "Waking up to who you are requires letting go of who you imagine yourself to be." Most people think that our world is genuinely solid, that they are their bodies. But our world is not genuinely solid, and the real us is not our bodies. Reality is fairly analogous to a hologram, and the real us is God/Ultimate Reality/Consciousness having a dream as whatever manifestation it happens to currently occupy. As Adyashanti says, "The ego is just a mask that Awareness wears." And as Mooji says, "If God is infinite, then God is where you are right now." Take two waves in the ocean. It's a dual stance to say the two waves are different or separate, and it's also a dual stance to say the two waves are the same or one. The reality is that the two waves are connected within the ocean; in other words, the two waves are waves and the ocean at the same time. So to only say the two waves are different or to only say the two waves are the same is to speak of just one portion of the truth—but neither statement is untruth. The truth is a logical contradiction. And why should we expect the nature of a reality which exists on its own, of itself, to not be paradoxical? The law of non-contradiction is mistaken. A self-existing reality can only seem to exist but not actually exist. Reality neither exists nor lacks existence. What is the sound of one hand clapping? We are Nothing, yet Awake; and we are Awake, yet Nothing. Logic has its many uses within reality (e.g. "If I eat more food, then I will become less hungry. "), but it breaks down completely when it tries to deal with the nature of reality itself. A classic way of illustrating the rough stages of enlightenment goes something like, "At first, mountains are mountains and rivers are rivers. Then, mountains are not mountains and rivers are not rivers. Then, mountains are not mountains and rivers flow." The first stage, the default view of the world most of start out with, is that everything is really real (this is the standpoint of the Relative). The second stage, the view of the world most of us have after studying Buddhism or Zen for a little awhile, is that everything is really illusory (this is the standpoint of the Absolute). In the third stage you realize that everything simply is, appreciate all experiences, and live spontaneously. So, are rivers rivers or are rivers not rivers? Rivers flow. "What's happening is aware of itself." When vague and seemingly incomprehensible statements like that make intuitive sense to you, you know you understand non-duality. To break it down: "What's happening"—in other words, all that exists—"is aware of itself." In other words, we are a self-aware consciousness, and every seemingly separate thing is that self-aware consciousness. Universal Consciousness interpenetrates all phenomena. A common quote goes something like, "Searching for enlightenment is like a little fish in a big ocean looking for water." And in the words of Rumi, "You are not a drop in the ocean; you are the entire ocean in a drop." The Atman (the small self) is the Brahman (the great Self). We do not have different or separate souls; we share a universal Soul. There are not multiple things in reality; reality is one Thing. Meister Eckhart said that "distinction never gazes" when reality is not filtered through the lens of the entranced body-mind. I've seen one person say, "Explaining what reality looks like after awakening is like explaining three dimensions to an inhabitant of flatland." According to Rupert Spira, "All experience is illuminated, or made knowable, by the light of pure Knowing. This Knowing pervades all thoughts, feelings, sensations and perceptions, irrespective of their particular characteristics. We are this transparent, unchanging Knowing . . . From the viewpoint of the earth, the sun comes and goes, whereas it is, in fact, always present. Likewise, from the viewpoint of the body and mind, our essential nature of pure Awareness comes and goes, but, in its own experience of itself, it is ever-present." I think seeing beyond the separate self is often challenging at first partly because it necessitates a sort of death, a death of an identity. Awakening out of one's identification with the ego is a very, very huge change. It's a radical uprooting and upheavaling of one's world and beliefs. When you really see into the illusory nature of the separate self, it can be quite scary and shocking. "Oh my God, the person I thought I was isn't actually here, is illusory." One can only see with the eyes of Love by facing the Fear of seeing beyond the ego, of seeing that the ego doesn't actually exist, of seeing into one's own Nothingness. Albert Camus said the only serious philosophical question is whether to commit suicide. I think the only serious philosophical question is whether reality is non-dual. Is everything disconnected or is everything connected? Is everything different or is everything the same? Is everything real or is everything illusory? The technical "truth" is that everything is both disconnected and connected; everything is both different and the same; everything is both real and illusory. But what is the greater truth? Is Fear or Love greater? Love is greater. "Love is All; Love is You." There is no path to awakening. You cannot grasp yourself in the same way you cannot bite your own teeth. 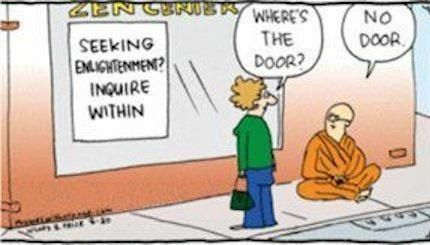 You are that which you seek. The core "technique" is to just let Awareness rest as itself. That's all you "do." Be still, be quiet, relax. As Rumi said, "Silence is the language of God; all else is poor translation." Most of us put death out of our minds to maintain remote sanity and contentment. We go about our day-to-day lives pretending to ourselves that we will never actually die. Everyone knows, of course, that we will eventually die, but most of us, at least most of the time, almost entirely remove that knowledge from our conscious minds. Some people try to appear tough in front of others (and themselves) by claiming to not fear death while rattling off some semi-reasonable rationalization, but the truth is that most of us are very deeply afraid of death. "According to the 2008 National Survey on Drug Use and Health, in the US there were 8.3m adults who had serious thoughts of committing suicide, and 2.3m who had actually made plans to commit suicide. Of those, 1.1m actually attempted suicide, but only just over 33,000 succeeded. Which would make the ratio of failure to success 33 to 1." Those statistics are the case even despite the fact that we all know death is soon and inevitable. The plain and undeniable fact is that the prospect of genuine death, annihilation, ceasing to exist forever and ever, is very scary and very undesirable to most us. So, what seems more plausible: 1) God manifests as All, death is an illusion, and everything is extremely neutral, or 2) There is no God, death is not an illusion, and everything is extremely bad? I'd suggest the neutral possibility is the more plausible one. In the same way everlasting heaven is far too good to possibly be real, everlasting non-existence is far too bad to possibly be real. God wants to suffer; only its manifestations do not. Goodness needs badness just as much as badness needs goodness. "Variety is the spice of life." A car crash is just as useful as a wedding, and a mass murderer is just as useful as a saint. A car crash isn't good, but what use is goodness without badness? Indeed, how is the existence of goodness even conceivable without the existence of badness? (So, to be accurate, then, God doesn't really want to suffer so much as God must suffer, because goodness and badness necessarily go together like all pairs of opposites.) All experiences are equally useful and equally necessary, and no manifestation is better or worse than any other in any way, shape, or form. So, love everything and everyone. "The Presence of God is paradoxically exquisitely gentle and infinitely powerful. What you experience depends on where you are coming from. If you are coming from a place of ego, then God's Presence is terrifying and fire-like. If you are coming from a place of Truth, then God's Presence is soothing and full of divine light . . . You want to encode your mind with the best option available. This is inner sobriety, love for all beings, and forgiveness for yourself and all others. It may seem mundane and unsexy, but this day-in, day-out encoding of positive virtues is the real grunt work of spirituality." Don't hold your breath, PO. All I see is a bunch of fake premises and fallacies. Why you ask this stupid nonsensical question? No it isn't. No, it doesn't even make sense to ask this becuase it is a meaningless question you're the one giving the false premise, a false question that no one ever asked. What do you mean by everything? What do you mean by the 'same'? Not even your post will be the same as the one below... but If I copy your post it will be the same as mine... so what do you mean by that? why are you using absolute false fallacies and premises and your questions are meaningless? Can I guess? You're n the same cult as the others here promoting the agenda we all know about. No. There is no God,Glob,FSM or Zeus... No, Zeus did not create sometihng out of void. Void is simply the empty space between you and sometihng else... no mystery. So where are you all shills coming from? making fake accounts to promote this solipisistic false garbage ? Atoms considered empty are a misconception. They are proven not to be empty anymore. So , again you're debunked.